Definition at line 47 of file llhudeffecttrail.h. Definition at line 58 of file llhudeffecttrail.cpp. References f, mFadeInterp, mFinalRadius, mFlickerRate, mInitialRadius, mKillTime, mScaleBase, mScaleVar, mSpinRate, mVMag, and mVOffset. Definition at line 76 of file llhudeffecttrail.cpp. Definition at line 80 of file llhudeffecttrail.cpp. References LLHUDObject::markDead(), mPartSourcep, and NULL. Referenced by render(), and unpackData(). Definition at line 90 of file llhudeffecttrail.cpp. 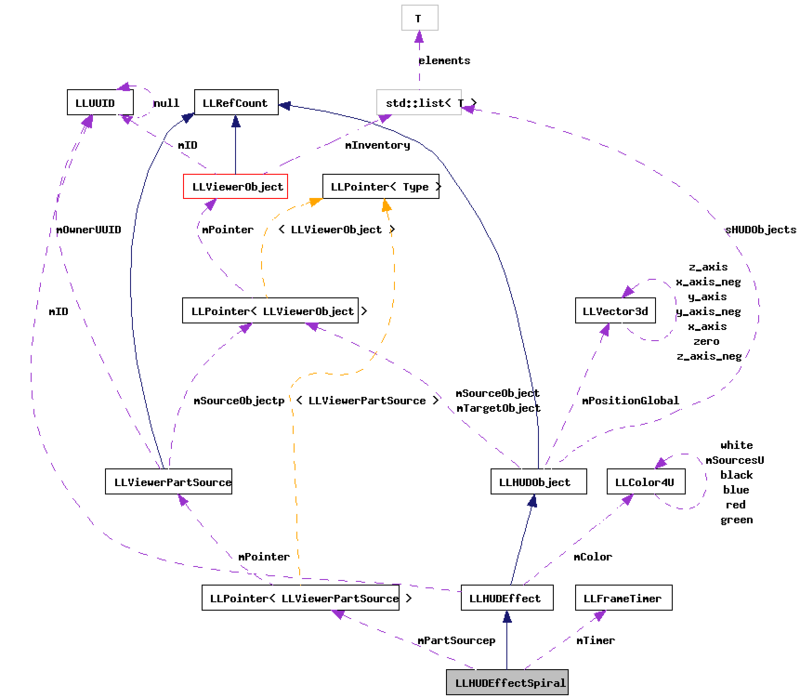 References _PREHASH_TypeData, htonmemcpy(), LLVector3d::isExactlyZero(), LLVector3d::mdV, LLHUDObject::mPositionGlobal, LLHUDObject::mSourceObject, LLHUDObject::mTargetObject, MVT_LLUUID, MVT_LLVector3d, and LLHUDEffect::packData(). Definition at line 276 of file llhudeffecttrail.cpp. References LLControlGroup::getBOOL(), LLFrameTimer::getElapsedTimeF32(), gSavedSettings, LLPointer< Type >::isNull(), markDead(), mKillTime, LLHUDObject::mSourceObject, LLHUDObject::mTargetObject, and mTimer. Definition at line 55 of file llhudeffecttrail.h. Definition at line 59 of file llhudeffecttrail.h. Definition at line 54 of file llhudeffecttrail.h. Definition at line 56 of file llhudeffecttrail.h. Definition at line 57 of file llhudeffecttrail.h. Definition at line 58 of file llhudeffecttrail.h. Definition at line 266 of file llhudeffecttrail.cpp. Referenced by LLToolDragAndDrop::commitGiveInventoryCategory(), LLToolDragAndDrop::commitGiveInventoryItem(), LLToolDragAndDrop::dad3dTextureObject(), LLToolDragAndDrop::dropInventory(), LLToolDragAndDrop::dropScript(), LLSelectMgr::selectionSetImage(), and unpackData(). Definition at line 52 of file llhudeffecttrail.h. Definition at line 53 of file llhudeffecttrail.h. Definition at line 179 of file llhudeffecttrail.cpp. References gAgent, LLPointer< Type >::get(), LLControlGroup::getBOOL(), LLFrameTimer::getElapsedTimeF32(), LLAgent::getID(), LLAgent::getPosAgentFromGlobal(), gSavedSettings, gWorldPointer, LLVector3d::isExactlyZero(), LLPointer< Type >::isNull(), LLViewerPartSource::LL_PART_SOURCE_BEAM, mbInit, LLHUDEffect::mColor, LLHUDEffect::mDuration, mKillTime, mPartSourcep, LLHUDObject::mPositionGlobal, LLHUDObject::mSourceObject, LLHUDObject::mTargetObject, mTimer, NULL, LLViewerPartSourceSpiral::setSourceObject(), LLColor4::setVec(), and TRUE. Definition at line 116 of file llhudeffecttrail.cpp. References _PREHASH_Effect, _PREHASH_TypeData, LLViewerObjectList::findObject(), LLMessageSystem::getBinaryDataFast(), LLMessageSystem::getSizeFast(), gObjectList, htonmemcpy(), LLUUID::isNull(), llendl, llwarns, markDead(), LLUUID::mData, LLVector3d::mdV, LLHUDObject::mPositionGlobal, MVT_LLUUID, MVT_LLVector3d, NULL, S32, LLHUDObject::setSourceObject(), setTargetObject(), size, triggerLocal(), and LLHUDEffect::unpackData(). Definition at line 64 of file llhudeffecttrail.h. Definition at line 83 of file llhudeffecttrail.h. Definition at line 96 of file llhudeffecttrail.h. Definition at line 90 of file llhudeffecttrail.h. Referenced by LLHUDEffectSpiral(), and setFinalRadius(). Definition at line 92 of file llhudeffecttrail.h. Referenced by LLHUDEffectSpiral(), and setFlickerRate(). Definition at line 89 of file llhudeffecttrail.h. Referenced by LLHUDEffectSpiral(), and setInitialRadius(). Definition at line 86 of file llhudeffecttrail.h. Referenced by LLHUDEffectSpiral(), render(), and triggerLocal(). Definition at line 84 of file llhudeffecttrail.h. Referenced by markDead(), and triggerLocal(). Definition at line 93 of file llhudeffecttrail.h. Referenced by LLHUDEffectSpiral(), and setScaleBase(). Definition at line 94 of file llhudeffecttrail.h. Referenced by LLHUDEffectSpiral(), and setScaleVar(). Definition at line 91 of file llhudeffecttrail.h. Referenced by LLHUDEffectSpiral(), and setSpinRate(). Definition at line 95 of file llhudeffecttrail.h. Referenced by render(), and triggerLocal(). Definition at line 87 of file llhudeffecttrail.h. Referenced by LLHUDEffectSpiral(), and setVMag(). Definition at line 88 of file llhudeffecttrail.h. Referenced by LLHUDEffectSpiral(), and setVOffset().